This handmade bracelet features eight great BIG (12mm diameter) vintage Swarovski crystal discs, each one channel set in brass. 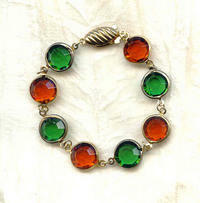 The colour sequence is alternated between Madeira topaz -- a rich coppery amber -- and a piney green called green turmaline. With the vintage brass fish hook clasp, the bracelet measures about 7-1/2" long. It's another bargain beauty from SPARKLE PLENTY.